This black and white photograph shows a broadside advertising the public sale of lots in the territory town of Pawnee, Kansas. Pawnee, adjacent to Fort Riley, Davis County (later Geary County), was a town organized during the territorial period. It served at the territorial capitol for only four days in 1855. During the summer of 1855, members of the Kansas territorial legislature journeyed to the town of Pawnee to attend the first session on July 2 called by Governor Andrew H. Reeder. When they arrived, however, they were dismayed to find that the stone structure that was to serve as the first territorial capitol was far from ready. On July 4 the legislature passed a bill providing for the temporary establishment of the capital at the Shawnee Methodist Mission. Two days later the governor vetoed it on the grounds that the legislature had overstepped the authority conferred upon it by Congress. Both houses, however, promptly passed the bill over his veto and then adjourned to meet at Shawnee Mission on July 16. 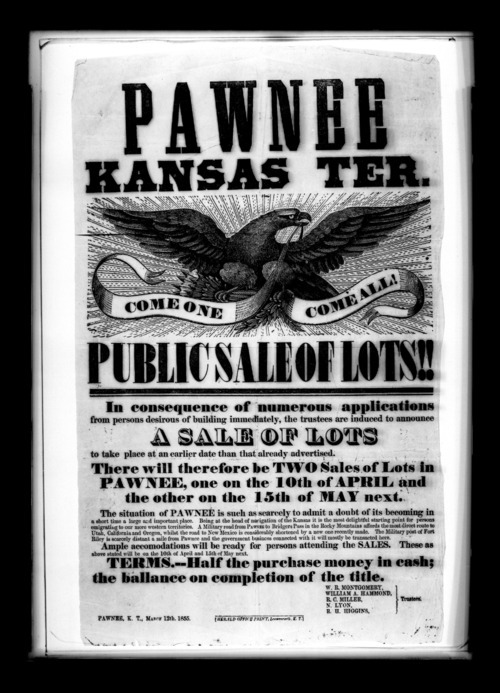 This black and white photograph shows a broadside advertising the public sale of lots in the territory town of Pawnee, Kansas. Pawnee, adjacent to Fort Riley, Davis County (later Geary County), was a town organized during the territorial period. It served at the territorial capitol for only four days in 1855. During the summer of 1855, members of the Kansas territorial legislature journeyed to the town of Pawnee to attend the first session on July 2 called by Governor Andrew H. Reeder. When they arrived, however, they were dismayed to find that the stone structure that was to serve as the first territorial capitol was far from ready. On July 4 the legislature passed a bill providing for the temporary establishment of the capital at the Shawnee Methodist Mission. Two days later the governor vetoed it on the grounds that the legislature had overstepped the authority conferred upon it by Congress. Both houses, however, promptly passed the bill over his veto and then adjourned to meet at Shawnee Mission on July 16.